Prizewinning short about a baby placed in a virtual doll environment Las Palmas, getting drunk and goes bananas like any other uncivilized tourist would do. Several years have gone since Pinocchio became a real boy. Having adjusted to the anonymous lifestyle, Pinocchio is terrified when he one day begins to turn into wood again. A poet and writer gets fired from his job at a local newspaper after writing a review of his own work. To make ends meet he gets a job at the shipyard, a world completely different from the one he is used to. A shadow puppet play about love and sorrow featuring the Girl, the Bird and Death. Barbara Thorburn wiles away the hours with memories of Greta, her mother, the poet. All he wanted was to be with his mother. This can be easily the Swedish version of 'The Elephant Man'. It ain't a biography nor a documentary, yet has a simple and heartwarming story. It is also a sport themed flick. The sport not widely known, excluding the Europe. The first feature film for the director and a good film to debut with. He had waited for a decade to make this film and he should be proud and happy for accomplishing that. On the outside the film looks like ordinary, but not for making. Especially not for a small cost film like this. Everybody had put a great effort, particularly the lead actor. The story of an autistic and severely deformed man, the 30 year old Rikard is not an average guy you would see in your daily life. That is one of the reasons why he struggles in the society. Not because he's different looking, but not all the people are kind to him. All of his life he is known was the game, Petanque. And all in life he wanted was to be with his mother. So he took the game very seriously and decided to win the championship, just to win his mother's love as well. How far he would go and how far it would take him to his mother are the remaining parts to reveal. 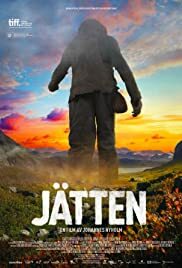 This is not a popular Swedish film, though I wonder why is that. Of course it did not have any specialty like a powerful twist or turn. All it had was a strong lead character, and with that, it got forward with a clichéd storyline. The scenes were predictable, particularly the end. But I liked the mix of fantasy/illusion and reality. Rikard from the inside, was living in his own world. He had his own version of guardian angel, and a close friend who stood for him all the difficulties. In his both the world, together, they had set to accomplish the things. One of his prime objective was to get back to his mother. The screenplay should have been more engaging. Otherwise, should have been emotionalised. Or both. Because such theme needs a strong sentiment base. Definitely that would have drawn-in the family audience. Yet it is still a family film, and the end still be emotional for some people. But for me, it looked more a fairy-tale than touching. Even though everybody must agree that it was an apt ending. The focus was very clear, what the film wanted to show us and what the characters wanted to reveal to us. The characters had less depth, like in case of the mother's role, but ultimately how all of them linked together and brought together at the end was nicely done. Regarding the sport from the film, it looks like the marble (goli) game that's played in our local. Except it was the small orbs and instead of the whole arm, just fingers used to play while thumb firmly on the ground. I wish they had explained the game properly for the viewers from other continents like me. It looked fun and simple game, I think I almost understood, except the rules. But I can understand the story was not designed to start the game from the scratch, I mean intro. Besides, it was a part of the story, not the whole story. Nicely utilised a small sport in a film. Just below 90 minute film, one of the special film, yet there's nothing too much to praise heavily. Sometimes a simple script like this is better to end decently than too much of establishment to aim greater, which most of the times fails terribly. Especially from the beginner's perspective. So now the director can try something big in his next and can demand big budget as well from his production house. All I wanted to say is if you want to try this, don't anticipate, just watch it with an empty mind. You might have seen many similar films, so as I said it is not hiding that fact, just trying to be a simple, meaningful drama than useless nonsense we see all the time. It is not a must see, though it won't make you any harm for watching at once.